OH MY GOSH! This book was the best the series yet! It is jam packed with action and romance. I was seriously glued to this book. There is SO much happening here I was going crazy over all the excitement! Clary is such a great character and I'm so jealous over her red hair! I could imagine her Shadowhunter fighting gear in my head and was all about the fight. All our favorite characters were here, and I really got to understand each of them just a little bit better. I was rooting for them the whole way through. Jace still has won my heart and I am SO happy with the ending of this book. It has been what I was waiting for! 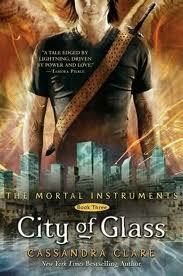 I can't wait to start the next book City of Fallen Angels!